Man, that brings back memories. 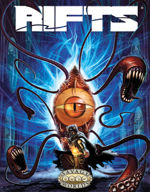 RIFTS was my go-to game back in high school, and I played it with my friends all the time. We owned, between us, somewhere in the neighborhood of thirty RIFTS books, a stack so large that it monopolized a lot of the floor and shelf space in my bedroom. We'd tell stories of plucky rebels going up against the Coalition, vampire hunters in South America, magical ninjas in Europe. Good times. I haven't played RIFTS in a long time, largely because my tastes as far as system have changed quite a bit. I enjoyed Palladium's system immensely as a younger man, but as I've gotten older I've come to appreciate simpler, more focused systems. The setting, though . . . RIFTS still calls to me, as a world in which to set gonzo, kitchen sink-style stories. And now there's news that Palladium has licenced RIFTS out to Pinnacle Entertainment, makers of Savage Worlds. Interesting. Very interesting indeed.